On July 14th 1986 Columbia Records released the 24th studio album by the legendary Bob Dylan, "Knocked Out Loaded". Although released while Dylan was on a high-profile tour with Tom Petty, critics were generally harsh on the album, and coming as it did during a brief period when his recording career was experiencing a slump in sales, the album did not perform well commercially. Remaining largely unheard in the decades since, the one track that has received uniform praise, 'Brownsville Girl', has been plucked for several compilations, thus removing the one reason many people would buy this album in the face of it's bad reputation. Why does "Knocked Out Loaded" have so few defenders? Why do some fans contend the album is worse than "Self Portrait"? I've found many bad reviews, but precious little in the way of explanation. It would seem as though it's criticized by many with preconceived expectations. The purpose of this small bit of cyberspace is to present another viewpoint. I am just a fan, not an authority on Dylan, but as one who has listened to and enjoyed "Knocked Out Loaded" for many years I believe this album deserves a deeper look. First of all, before this album can be appraised for what it is, it needs to be acknowledged for what it isn't. 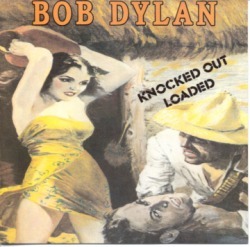 "Knocked Out Loaded" was recorded and overdubbed over the course of several sessions with many different backing musicians rather than with a stable lineup and a focused session (in some cases, there are musicians that, sadly, Dylan would never play or record with ever again, at least to date). There are three cover versions, three co-writes and two solo compositions; this is not an album entirely written by Dylan. There are no production credits on most issues, although it has been fairly accepted that Dylan himself produced the album. A Mexican import release states what we've always assumed and notes 'Got My Mind Made Up' was co-produced by Dylan and co-author Tom Petty. The album is not, on the surface anyway, thematically put together like many of his works. "Knocked Out Loaded" is not a protest record (like his earliest albums), is not about a failed relationship (like "Blood On The Tracks"), is not focused on his Christianity (like "Saved"), is not a bizarre attempt to confuse fans (like "Self Portrait"), is not an attempt to make a stylish album of it's time (like "Empire Burlesque"), is not devoted to whimsy (like "Under The Red Sky"), is not a blues / folk throwback (like "World Gone Wrong"), nor is the album a loose, relaxed effort (like "Down In The Groove"). However, each of these elements are present in "Knocked Out Loaded". These and more. As we go through the songs one by one, and contemplate not only his choices and performances but also the sequencing, a pattern emerges. It is definitely true that this album is not an especially easy one to decipher as Dylan's intentions are not worn on his sleeves here. To make matters even more difficult, Bob Dylan himself has rarely spoken of the album and when he has it would seem he shrugged it off. Yet, as his fans well know, he is usually not the most reliable source for commentary of his own work. Had this album been more successful or more acclaimed, it would probably have been more conducive for him to reflect more seriously on it. But as "Knocked Out Loaded" sadly fell off the pier amid the bad reviews and consumer indifference, and as it's reputation remains in the basement, it's left up to listeners to dust it off and give it a try. Not every single one of Dylan's albums are brilliant, but even the weakest of them have much to offer. Of course our opinions as to which are his greatest and weakest albums will likely vary. I consider "Knocked Out Loaded" his most fascinating work and it remains my personal favorite - you may well disagree, and that's fine. Just don't dismiss the album out of hand because you are doing yourself a great disservice.